Understanding the evolutionary and ecological processes that influence the diversity of life is essential to our society and is one of the most intriguing fields of research of our time. We contribute towards internationally significant databases (Paleobiology Database) and develop new methods of analysis to provide insights into fundamental mechanisms. Alroy J, et al. (2008) Phanerozoic trends in the diversity of marine invertebrates. Science 321:97-100. Figure: The traditional (left) and current (right) view of changes in global marine biodiversity through the Phanerozoic eon. The traditional pattern resulted from a simple compilation of genus ranges (based on the data of Sepkoski 2002), whereas the current pattern (from Alroy et al. 2008) is based on a large database of more than a million fossil occurrences allowing the application of rigorous methods of sampling standardization. While the symbiosis of algae and corals is often thought to be of mutual ecological advantage, the evolutionary success of scleractinian corals is not necessarily determined by photosymbiosis. The approximately equal number of zooxanthellate and azooxanthellate coral species today (both have about 750 extant species) rather suggests some macroevolutionary trade-off. In a DFG-funded project we combine time-calibrated molecular and fossil data to derive a best estimate of diversification rates over time for different ecological modes of scleractinian corals. We could already show for reef corals that results are similar for fossil and molecular data such that the data can be combined to derive unbiased rates (Simpson et al. 2011). The same toolkit is now applied to azooxanthellate corals which have a much worse fossil record. 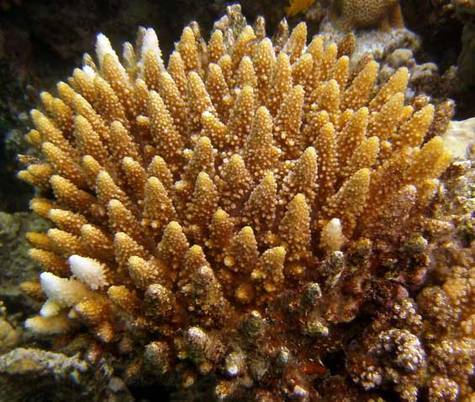 Acropora, the most widespread zooxanthellate reef coral today (Red Sea, Egypt). Among the greatest value of paleontology is its ability to assess directly the magnitude and timing of ancient extinction episodes, if biases of the fossil record are accounted for. While time-calibrated molecular data can be used to assess diversification rates, only the fossil record informs us about ancient extinctions. By far the most quantitative data on extinctions stem from the marine fossil record in shelf habitats. 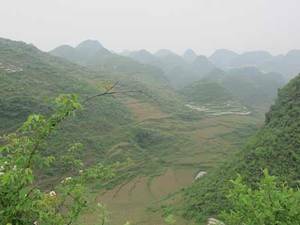 This is exactly the habitat for which current extinction rates are most difficult to assess and thus data deficient. One of the most important patterns emerging from the fossil record is that ancient mass extinctions are usually associated with times of global warming rather than cooling as previously believed (see the figure). Several projects at the GeoZentrum target patterns, causes and evolutionary consequences of marine mass extinctions. Patterns are evaluated with detailed field work combined with geochemical analyses and database analysis. Our foci are the end-Ordovician mass extinction (Delabroye et al. 2011), Silurian bioevents (Munnecke et al. 2012), the Permian-Triassic mass extinction (Joachimski et al. 2012), the end-Triassic mass extinction (Kiessling et al. 2007, 2009), and the end-Cretaceous mass extinction (Aberhan et al. 2007; Schulte et al. 2010). Aberhan M, Weidemeyer S, Kiessling W, Scasso R, & Medina FA (2007) Faunal evidence for reduced productivity and uncoordinated recovery in Southern Hemisphere Cretaceous/Paleogene boundary sections. Geology 35:227-230. Delabroye A, et al. (2011) Phytoplankton dynamics across the Ordovician/Silurian boundary at low palaeolatitudes: Correlations with carbon isotopic and glacial events. Palaeogeography, Palaeoclimatology, Palaeoecology 312:79-97. Joachimski MM, et al. (2012) Climate warming in the latest Permian and the Permian-Triassic mass extinction. Geology 40:195-198. Kiessling W & Aberhan M (2007) Environmental determinants of marine benthic biodiversity dynamics through Triassic-Jurassic times. Paleobiology 33:414-434. Kiessling W, Aberhan M, Brenneis B, & Wagner PJ (2007) Extinction trajectories of benthic organisms across the Triassic-Jurassic boundary. Palaeogeography, Palaeoclimatology, Palaeoecology 244:201-222. Kiessling W, Roniewicz E, Villier L, Leonide P, & Struck U (2009) An early Hettangian coral reef in southern France: Implications for the end-Triassic reef crisis. Palaios 24:657-671. Munnecke A, Delabroye A, Servais T, Vandenbroucke TRA, & Vecoli M (2012) Systematic occurrences of malformed (teratological) acritarchs in the run-up of Early Palaeozoic δ13C isotope excursions. Palaeogeography, Palaeoclimatology, Palaeoecology 367-368:137-146. Schulte P, et al. (2010) The Chicxulub asteroid impact and mass extinction at the Cretaceous-Paleogene boundary. Science 327:1214-1218. 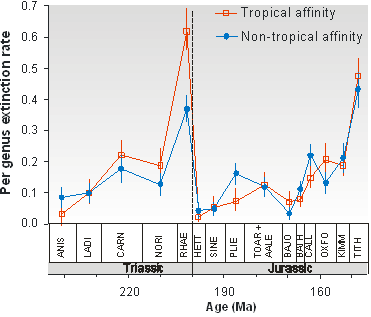 Tropical genera were hit significantly harder during the end-Triassic mass extinction that non-tropical genera. This suggests that global warming was an important trigger of the extinctions (from Kiessling and Aberhan 2007). The Cambrian period marks the appearance of modern animal phyla in the fossil record. It also marks the origin of organisms with skeletons, the invention of complex food webs, which are in many similar to modern ones, and an increase of global biodiversity. Because of the geologically sudden appearance of these events these changes are commonly referred to as the Cambrian Explosion. 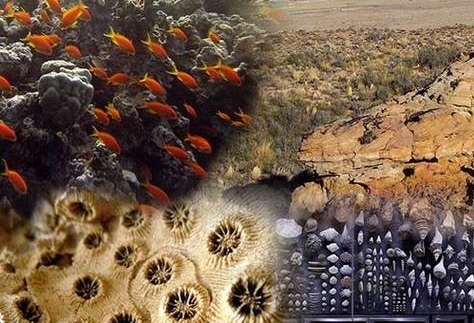 Geological, ecological and genetic factors are discussed as causes of the Cambrian Explosion. Embedded in an international Research Group (Opens external link in new windowFOR 736), our team in Erlangen explores global and regional biodiversity dynamics during Ediacaran-Cambrian times. Biodiversity dynamics are analysed to (1) uncover the timing of major changes on different continents and (2) to assess if the Cambrian bioradiation was triggered mostly by an increase of within-community diversity (alpha diversity) or rather by an increasing difference among communities (beta diversity).